March For Our Lives, a demonstration involving survivors of the Parkland school shooting that will take place Saturday in Washington, D.C., and across the country, registered a 501(c)(4) nonprofit advocacy organization that is not required to disclose its donors. 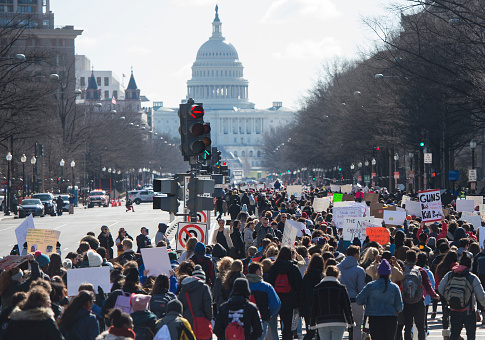 The March for Our Lives Action Fund, a 501(c)(4) "social welfare" nonprofit organization, was registered on March 8 with the D.C. Department of Consumer and Regulatory Affairs, records show. The action fund lists its business address in Encino, Calif., and its agent as CT Corporation System, a D.C.-based firm that offers agent, incorporation, and corporate business compliance services. Jeri Rhodes, an associate executive secretary for finance and administration at the Friends Committee on National Legislation, a group that "lobbies Congress and the administration to advance peace, justice, opportunity, and environmental stewardship," is also listed as the action fund's executing officer and governor on its registration. Rhodes previously served as chief financial officer for Greenpeace. While the organization said on its website it is "for kids and by kids" and the "March For Our Lives organizers are the kids themselves," it also said the kids "have brought in support to help ensure it is a success." A coalition of liberal advocacy groups are currently involved in organizing and planning the march. In addition to support from leading gun-control groups like Everytown for Gun Safety, the Brady Campaign, and Giffords, organizers from the Women's March, Planned Parenthood, and Move On are involved with the permitting for the event as well as promoting it. March For Our Lives is even directing donations to Everytown, which has set up a March For Our Lives Initiative under their own 501(c)(3) operation. Donations to that fund will be tax deductible, and its donors will have to be publicly disclosed. However, the March For Our Lives Action Fund, as a 501(c)(4) organization, will not be required to disclose its donors, and individuals who send cash to the group can remain anonymous. A 501(c)(4) designated group can be involved in political activity as long as it does not become its primary focus. The organization said on its website it chose to incorporate the group this way because it plans to lobby for new gun-control legislation even after Saturday's march. "March for Our Lives Action Fund is tax-exempt under section 501(c)(4) of the Internal Revenue Code," it said. "Unlike section 501(c)(3) charitable organizations which have restrictions on their lobbying activities, section 501(c)(4) organizations are permitted to conduct unlimited lobbying for federal tax purposes. This form of entity gives the students maximum flexibility to conduct high-impact legislative advocacy during the Day of Action and beyond." They said the donations being made to the group now will be used to cover expenses for the march and also future lobbying efforts. "Donations to the March For Our Lives Action Fund will cover all expenses associated with the march taking place in Washington, D.C., on Saturday, March 24th," the site said. "The funds will also be used to fight for comprehensive gun safety legislation at the local, state, and federal level, and will also include voter education, ballot initiatives, and lobbying state legislatures and Congress to protect America's kids." Despite the anonymous nature of the group's funding, there is some information on who has given money to the group thus far because a number of celebrities have announced their own donations publicly. Oprah Winfrey, George Clooney, Steven Spielberg, and Jeffrey Katzenberg have each donated $500,000. The fashion company Gucci has also publicly announced their own half-million-dollar donation. Those publicly disclosed donations total $2.5 million. The group also announced that the proceeds from the GoFundMe fundraiser, which raised $3.3 million in the immediate aftermath of the Parkland shooting, would be split between a separate fund that will help financially support the families of the victims and the March For Our Lives Action Fund. It is unclear how much money the Action Fund has raised since the GoFundMe fundraiser was ended and the group switched to raising money through The Action Network, a fundraising platform designed to assist progressive causes. The group won't be required to file financial disclosures for several months. Rhodes and March for Our Lives did not immediately return a request for comment. This entry was posted in Issues and tagged Democratic Donors, Gun Control. Bookmark the permalink.